Quinta Analytica is a global provider of high quality services in the field of drug testing, clinical studies and bioanalytical services, regularly audited by the Czech State Institute for Drug Control (SÚKL); it is GMP, GLP and GCP certified and has successfully passed 10 FDA audits. Clinical Trials: complete clinical (Phase I) study services include the actual clinical, bioanalytical, pharmacokinetic and statistical evaluation, as well as bioequivalence, pharmacokinetic and pharmacodynamic studies conducted in a fully-equipped facility with 60 hospital beds and Bioanalytical Lab. 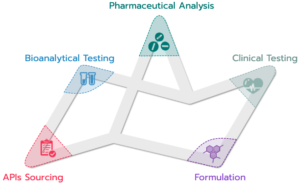 Formulation: Design and Optimization of formulations for dosage forms, Stability of the products, Bioavailability of the active ingredient, Chemical and physical parameters of the dosage form, Pre-formulation, publication research, Design and formulation of the dosage form (solid, semi-solid, liquid forms), Design of a suitable packaging material for the given dosage form, Accelerated stability and Natural stability studies. Bioanalytical Lab: Analytical service for clinical and pre-clinical studies including statistical evaluation, featuring state-of-the-art equipment, like HPLC/MS/MS devices to determine active substances and metabolites in different biological matrices and nine modern LC/MS/MS devices with triple quadrupoles, six of which with a 2-channel HPLC system. The capacity of the Bioanalytical department is up to 3750 analyses of biological samples per day. Sourcing or synthesis of impurities, standards, metabolites.